Lip augmentation is a popular procedure that creates fuller, plumper lips. It is used to enhance the appearance and reduce wrinkles around the mouth, sometimes referred to as “smoker lines”. It is equally popular among younger women wanting to have larger upper and lower lip and older women and men fighting the signs of aging. Hyaluronic acid (example: Juvederm Ultra or Juvederm Ultra Plus) is by far the most common product used for lip augmentation. It is a substance naturally found in human body. It is responsible for holding water and giving volume to the skin. As part of aging, body’s natural hyaluronic acid production slows, which in turn result in the appearance of fine lines and wrinkles. 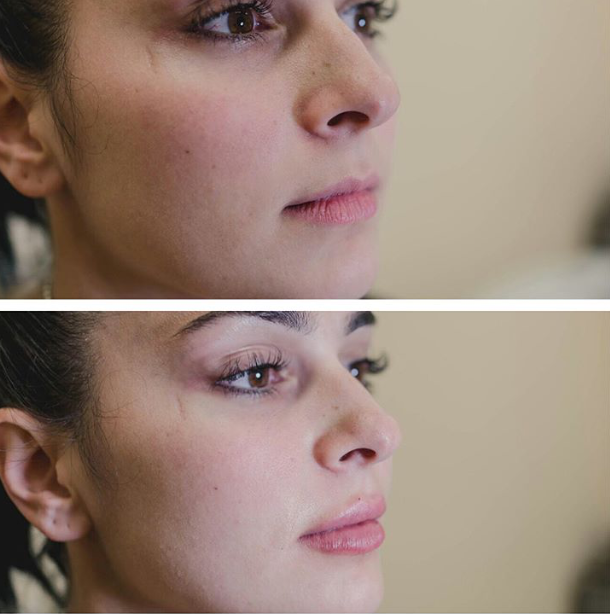 A simple, in-office procedure of lip augmentation with Juvederm can replenish the lost volume, smooth out the wrinkles around the mouth or create the lips you have always wanted. High Brow and Beauty Cosmetic Services offers Free Lip Augmentation Consultations. The appointment can be arranged several days or a week in advance by calling our Mamaroneck location. Consultations are used to evaluate your lip enhancement goals, help you learn about the procedure and answer all your questions. Treatment may be started on the same day. After the initial lip augmentation (enhancement) consultation the lips are numbed with topical anesthetic cream. After the lips are numbed and cleaned, it takes 10 to 15 minutes for your medical provider to inject your lips. The procedure involves a series of injections with a very small needle. The result are seen right away. IS THERE A RECOVERY TIME AFTER LIP AUGMENTATION (LIP ENHANCEMENT)? Your lips may feel sore and mildly swollen for a few days after the treatment. Some areas may also feel tender and sensitive. To reduce the risk of complications, it is important to follow all the instructions you receive during the consultation. To reduce the recovery time to a minimum we recommend using cold compresses immediately after the treatment. Using ice packs also reduces your chances of bruising and extends numbing effects of the anesthesia. You are also advised to keep the areas clean, avoid massaging the lips and smoking for 48 hours. HOW LONG DO LIP AUGMENTATION RESULTS LAST? Most of the hyaluronic acid based products last between six months to a year . Regular lip augmentation patients usually come back once or twice per year to maintain their results. CAN LIP AUGMENTATION BE COMBINED WITH OTHER TREATMENTS? Absolutely. To better improve age-related lines and wrinkles around the lips, lip injection treatments are effectively combined with Botox injections as well as Fractional Laser Resurfacing and Microneedling Radio Frequency Skin Tightening Treatments. AM I A CANDIDATE FOR LIP AUGMENTATION / LIP ENLARGEMENT? Lip augmentation is a highly customizable treatment developed to correct age-related lines and wrinkles around the lips as well as to enlarge and enhance the lips for for people wishing to have fuller, plumper lips. Call or text us today at 914-450-5543 for a free consultation. You can also email us at highbrowandbeauty@gmail.com.